A testimonial–“The citrus trees are doing very well since we did the soil test and amended same. Leaves are healthy … no leaf miner or other issues.” –Gene K.
Items in the analysis include pH, Total Cation Exchange Capacity, Organic Matter %, Base Saturation Percentages including Exchangeable Hydrogen, Sulfur, Phosphorus, Calcium, Magnesium, Potassium, Sodium, Boron, Iron, Manganese, Copper, Zinc, Aluminum, and Estimated Nitrogen Release, plus rarely tested, but very important, elements Cobalt, Molybdenum, Nickel, and Silicon, along with electrical conductivity (EC) . Exact calculations are made, along with balancing ratios between various elements. Don’t worry if you don’t understand all of these items. The recommendations will be made clear and easy to implement. The recommendations are also made in keeping with the USDA’s organic certification guidelines. Click here to order Nutrition Grown™ soil analysis. 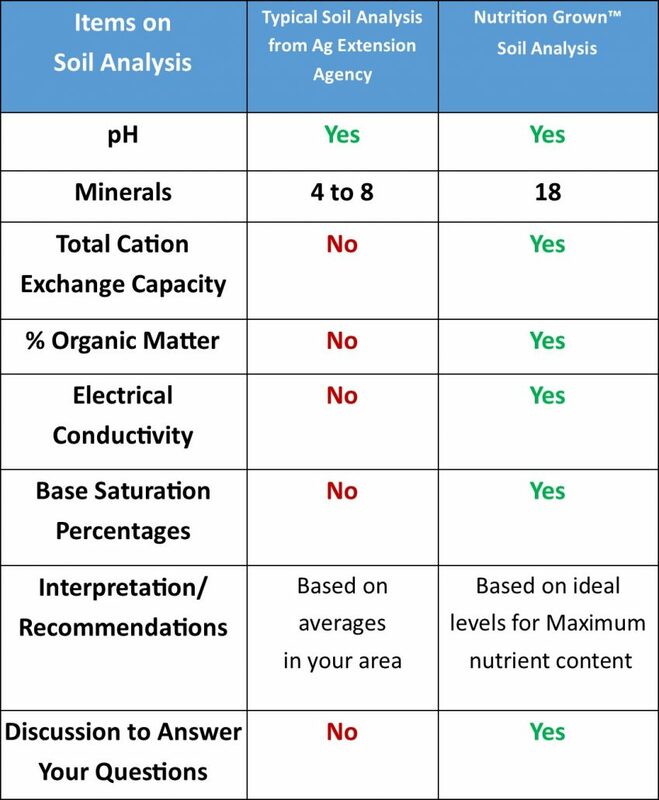 The initial soil mineral analysis with interpretation, specific recommendations for soil fertilizers and amendments, and 30-minute follow-up phone discussion with Dr. Bogs is $149, additional analyses ordered at the same time are $99 each. You will also receive “Tips for Applying Amendments” at no additional charge. Click here to order Nutrition Grown™ soil analysis. Dr. Bogs is also available for farm visits and research projects. Please email at info@BeyondOrganicResearch.com . Soil toxic metal analyses and soil toxic chemical analyses are also available. Click here to read more about these. Before ordering soil analyses, you will need to assess your property to determine the number of soil analyses you will need. See “How to Take Soil Samples” (below) for additional information. Click here to order Nutrition Grown™ soil analysis. Once payment is received you will be sent a worksheet to fill out and include with your soil samples. PLEASE ADD info@BeyondOrganicResearch.com TO YOUR ADDRESS BOOK SO YOUR WORKSHEET WON’T END UP IN YOUR SPAM FOLDER. Questions? Send an email to info@BeyondOrganicResearch.com . Obtaining representative soil samples is critical to accurate, helpful soil analyses. Sample each soil type area separately. It is often necessary to take 4 to 6 different soil samples, even from a residential property, because of the differences in soil types, soil treatments, previous crops, etc. in the various areas. Farms may need many more. Soils at different elevations on the property are often different in composition. Often soil has been moved—either graded for leveling, which exposes subsoil, or brought in from an outside source, i.e. potting soil. Soil areas have often been fertilized or amended differently, had animal pens on them, etc. These areas must be tested separately, as they will vary greatly in composition. 1. Probably the most efficient way is to use a soil probe or soil auger designed for this purpose. This should be made from stainless steel so you will not contaminate the sample with rust (iron). Some people use a piece of stainless steel pipe. First clear the surface of the spot you wish to sample of all organic matter, i.e. grass, weeds, leaves, etc. Push and twist the probe/auger as necessary to get it 6 inches into the ground. If the soil is hard, try getting the core soil sample out of the ground an inch or two at a time until you’ve penetrated the entire 6 inches. It may help to wet the soil, especially if you can water the area the day before attempting to take samples. If the soil in the probing holes is very dry and/or sandy so that it falls out of the probe before getting it into your mixing bucket, just add a little water to the hole. If the soil sticks in the probe, use a non-rusty screw driver or similar tool to help push it out. With very hard soils, try using a drill with a long drill bit to loosen the compacted soil core. If the soil is extremely rocky, use a pick to loosen the soil and do your best to get representative “cores”. 2. Use a non-rusty shovel. Dig a hole, then take a one–inch slice of soil from the side of the hole to a depth of 6 inches from the surface. Using a knife, cut away the soil near the sides of the shovel, leaving a one-inch wide strip down the middle. Place this in your bucket and repeat the process in several different spots until you have at least a cup of soil. Once you’ve gotten the volume of at least one “8-ounce” cup of soil into your bucket, mix the soil and remove obvious rocks and organic matter such as roots. Be sure to pack at least one full cup of soil to send. If the sample is extremely wet, allow it to air dry in a place where it will not become contaminated. Place the sample in a zip lock plastic baggie and label it well with a permanent marker. Each sample should be labeled with Dr. Jana Bogs, as your consultant, your name, address, phone number, and an identifiable name and/or Sample ID number. Make a map of your property with Sample ID names and numbers as your key. Multiple plots on large properties are often tracked by GPS (global positioning system) coordinates. 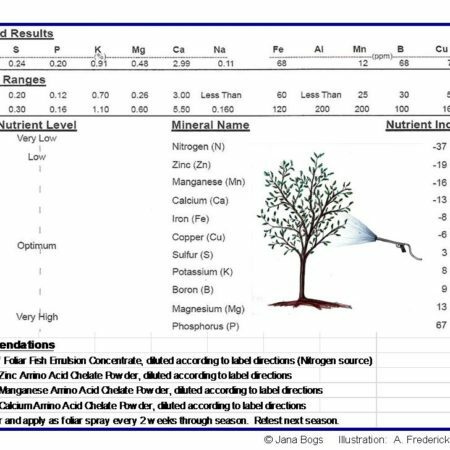 Fill out the soil sample worksheet that you got from Dr. Bogs. The worksheet comes with instructions on how to fill it out. It’s very easy to do. All you should need to put on the worksheet is your name, contact info, number of samples submitted and the Sample IDs. Include this worksheet in the box with your samples that you are sending to the lab. Pack the samples well in a sturdy box, not a mailing envelope. Add packing paper or “peanuts” as necessary to keep the samples from shifting in the box. The flat-rate boxes work well. The boxes themselves are free. You’ll usually see them displayed in the post office reception area, or you may need to ask the clerk. If you are sending soil from Hawaii, Alaska, or otherwise outside of the 48 contiguous states of the USA, you will need to put a USDA soil permit label on the front of the box. Just copy the label below, cut it out, and tape it on the front of the box to the left of the laboratory address. Send the box of samples to the laboratory address on the soil sample worksheet. The laboratory will send the raw numbers to Dr. Bogs, who will interpret them and send you the completed analysis, interpretation and recommendations. USDA soil shipping label used when shipping from Hawaii, Alaska or otherwise outside of the 48 contiguous states of the USA. 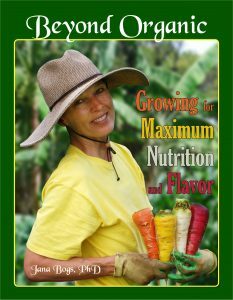 Grow your own “Beyond Organic” Nutrition Grown™ foods! 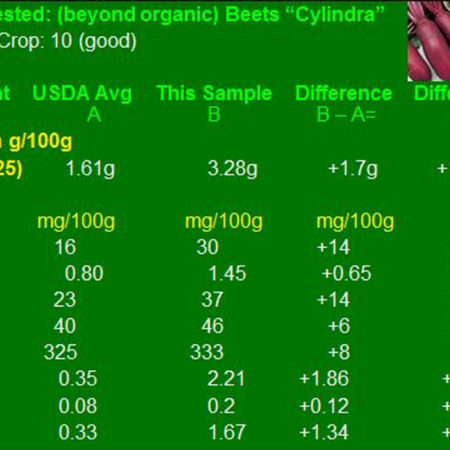 Get your soil analyzed and receive specific recommendations for growing the BEST by Dr. Bogs herself.